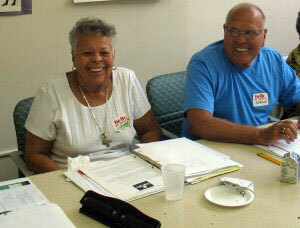 We have wonderful volunteer opportunities for people 55 or older as Peer Leaders. Peer Leaders facilitate groups on health and wellness, loss, preventing depression, life stories, and more. Groups meet at area senior community centers for about an hour a week for 12-week sessions. We’d like your help in referring individuals who you think would have the skill and ability to be a Peer Leader. Below is a list of volunteer criteria. Are You 55+ and Looking for a Meaningful Volunteer Experience? Touching Lives Over 55, a program of Journey’s Way, is currently recruiting Volunteer Peer Leaders to facilitate group discussions on health and wellness, aging issues and life after retirement. The groups meet weekly in senior community centers in Philadelphia. Must be 55 or better and enjoy working with older adults. Have a combination of these qualities: attentive to others, good listening skills, expressive and have a positive attitude towards life. Comfortable talking in groups and creating a safe space for people to share. Open to discussing aging and health issues, loss and grief, and life changes. Can commit to five training meetings before leading groups. Can commit to co-lead a 12 week peer discussion group. If you are unable to commit to a weekly group, substitute peer leaders are also needed. Can provide your own transportation to the weekly discussion groups and monthly volunteer feedback meetings. Complete the written application and provide references before a personal interview can be scheduled at Journey’s Way. We look forward to working with you on this meaningful volunteer opportunity.